We prepared for our cruise down the Southeast coast of the USA and then on to the Bahamas. Our original intention had been to include Cuba, but abandoned this plan when it became clear that we did not have sufficient time to do Cuba justice. By 15 January, we were ready to depart only to discover that the original route in was now blocked as the Army Corps of Engineers had decided to demolish the foundations of the old bascule bridge on the route to the marina and the channel was now closed for 14 days while the rubble was removed. The only way out of the marina was now via the new 65 foot bridge. 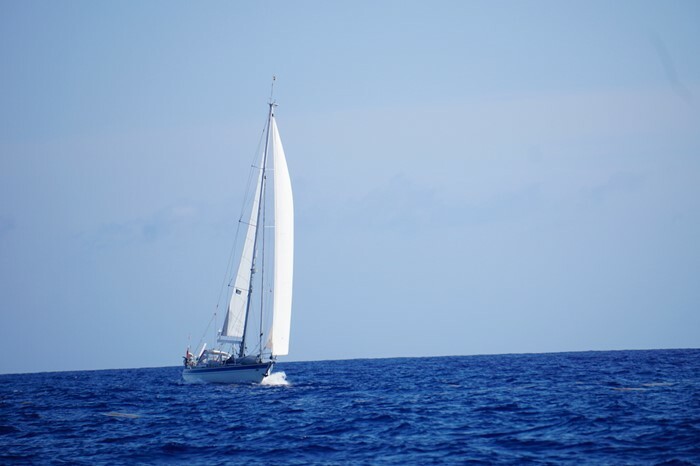 Our problem was with our fixed stainless steel burgee pole our mast height was 66 feet and even at low water we would not have sufficient clearance to escape. We were trapped! We therefore decided to remove the burgee stick, which reduced our mast height by 2 feet. Even so clearing the bridge at low water was a nerve wracking experience. From Beaufort we headed down to Bald Head Island and then on to Charleston where we linked up with old OCC friends Ed and Sue Kelly on Angel Louise. After several days sightseeing in this very attractive southern city we moved on to another historic southern town in Beaufort SC via the Intracoastal Waterway (ICW). Here we had drinks with Port Officer Allan Rae before moving on to Hilton Head, where Anne was due to play golf on the renowned course there. Next on the agenda was Savannah. However, as the town dock is still out of commission due to hurricane damage, we opted for Thunderbolt marina on the Wilmington river, which is a short bus or taxi ride from the attractions of downtown Savannah. It also has the advantage of a courtesy car, which is useful for provisioning and other tasks. From here we moved on to Brunswick GA, Fernandina Beach FL, Jacksonville FL before arriving in St Augustine FL, where we spent 5 days on a town mooring while we explored this charming historic city. Then it was on down the coast to Vero Beach FL, where we left Sofia on a mooring for 5 days while we visited friends inland. Next we headed down the ICW to Stuart FL to meet up with old friends Mark and Yvette Clarke, whom we had met on the OCC East Atlantic Rally in 2014. After that we moved on down the ICW to Hobe Sound FL, where we had a delightful encounter with Port Officers George and Nancy Marvin, which is described in the next edition of the OCC Newsletter. Our final trip on the ICW took us to Lake Worth Inlet, which is a good place to provision and fuel up before jumping off for the Bahamas. We set off for the Abacos on 10 March and after a fairly lumpy crossing of the Gulf Stream have spent the rest of March enjoying its stunningly clear turquoise waters and exploring Green Turtle Cay, Manjack Cay, Treasure Cay, Man-o-War Cay, Marsh Harbour and Lanyard Cay along the way. We are now in Royal Island, Eleuthera and will spend April exploring Eleuthera and the Exumas before heading north to Bermuda in early May. If all goes according to plan we should be in the Azores by the time our next report is due. Photo: Sophia on passage to Eleuthra.